As we mentioned last December, detached homes in the priciest parts of Greater Vancouver continue to hold their value despite predictions of a crash. Houses in Vancouver West (west of Ontario Street), the most expensive real estate zone in B.C., are 28 per cent above the levels of five years ago, while adjacent areas such as East Vancouver and Richmond are almost as strong. Apartment markets are weaker across the board, according to current figures from the Greater Vancouver and Fraser Valley real estate boards. 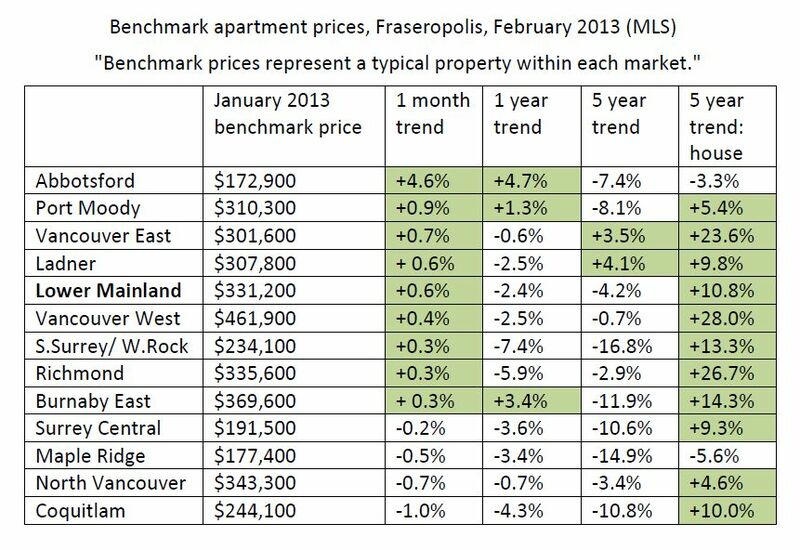 In every market from Abbotsford to West Vancouver, detached homes have outperformed apartments over the past five years. The differences are often dramatic. Coquitlam has seen a 10 per cent increase in house prices over five years, and a 10.8 per cent decrease in apartment values; detached homes in South Surrey/White Rock are up 13.3 per cent in the same period, compared with a 16.8 per cent slide in apartment prices. Apartment prices on the east side of the City of Vancouver have risen slightly (3.5 per cent), but in this area house prices are up 23.6 per cent. A modest general rally in apartment prices in February might be cause for hope for owners and sellers, but the fact is that markets have bounced around for years, generally in a downward direction. Looking for the simplest explanations, it’s clear that apartment supply has grown substantially since 2008, especially at tower-dominated transit nodes such as Brentwood, downtown New Westminster and Coquitlam Central. And there is almost certainly less speculative money going into apartments: investor opportunities for windfall gains are less, the politics of strata management can be tiresome, and the leaky condo problem is still with us more than 25 years after it first emerged. Despite the relative price weakness, developers continue to bring new supply on stream, presumably in expectation of a profit. 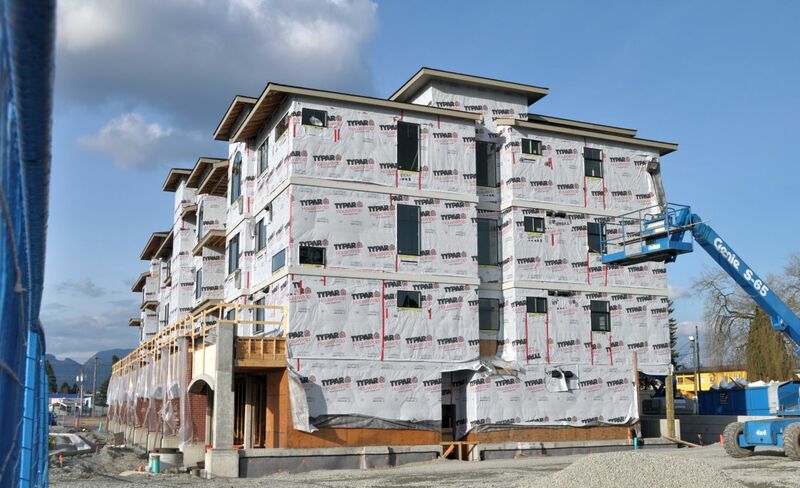 There are apartment projects underway in most of the places we’ve visited in recent months — Metrotown, Austin Heights, White Rock, Burnaby Heights, uptown New West, and on and on. This makes sense, at least theoretically, in a world where older people are retiring and downsizing, and where younger people are looking for their first home purchase. The relative price stability of the apartment markets makes it possible to plan a down payment and the ensuing monthly payments with some confidence. Writers on urban affairs assure us that many of today’s young people will be apartment dwellers for life, staying close to transit and walkable services rather than following their parents to the land of cul-de-sacs. Some even predict that the upper-end detached home in the middle and outer suburbs will become the real casualty in tomorrow’s real estate bubble. This trend may be taking hold already; it would be difficult to spot in price tables that report on large, diverse communities such as Coquitlam or Surrey.